A couple decades ago I had an idea for a script. It was a science fiction story that combined revolution plots with pop culture. For a short time I even had an agent. In the end I gave up on the script and tried to turn it into a short story. The rejections that said anything suggested there needed to be more. I took the hint and it became a novel. The specific inspiration came from Doctor Who revolution stories, Casablanca, and 80s pop princesses. You can also credit (or blame) my loose association with a Doctor Who fan club based in Chicago. Once my contract with the original publisher was over, I tried to find another. I’d already self-published some nonfiction and a short story collection, so I decided to do that with Expert Assistance. I tried to create my own cover, but I just didn’t have the tools. As it happened, an old friend, Matt Orsman, found me through Facebook last year. He liked my second novel and offered to use his artistic talents to help me sell books. I sent him my cover and asked for his view. He responded in a few days with a draft of the current cover. He had the final version done a few days after that. 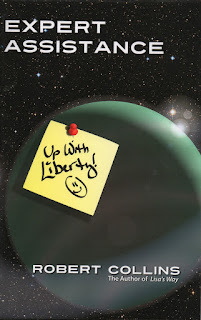 The cover of the original version had a Post-it note on a planet that said, “Free me! Don’t forget!” Nice, but not quite funny and in 2-D. I tinkered with the idea of a movie poster, then went back to the original concept. I wanted the note to say “Up With Liberty!” Wittier, and that’s one of the chapter titles. Matt did a good job taking my idea and turning it into art. Start by going to my blog, One Kansas Author (http://robertlcollins.blogspot.com/). From there I have links to my website, my Facebook page, the blogs I follow, and so on. Questor Corporation’s space station Q-12 strongly resembled a yes-man. It was small as corporate stations went, with only six dual-ship docking ports connected by the slenderest of transit tubes. In the middle of the six spindly spokes was a fragile cylinder of low-cost composites. Q-12 was built by overworked accountants, cheap contractors, and economized constructor-bots. It screamed of dealmaking and pliant praise. The “Skuld” was the latest starship to dock at Q-12. It was wildly out of place next to the station. Although much smaller than the station, it was dark, sleek, and tough. If Q-12 was built by accountants, Skuld was built by military officers in the field. The starship was owned by one Jake Bonner. He was not a military man, but a working spacer. He was too smart to be recruited, and too in love with space to stay grounded. He had lucked across Skuld on his travels. He had hoped that its power would bring him profit. He had not yet been so lucky. As his ship docked with Q-12, Bonner walked onto the ship’s bridge. It wasn’t an accurate term, but it was the best he could come up with. The “bridge” was divided in two. One part was a conversation pit with a large video screen, a couch opposite that, and comfortable chairs surrounding them. Up a half-dozen steps was wide desk with two seats, lighted panels, complex displays, and sophisticated read-outs. Bonner plopped down in one of the seats and waited for the controlling computer to update him. “The station is acknowledging,” it reported a moment later. Its voice was clipped, precise, and a shade on the stuffy side. “Our financial records show a debt of 8,467 cred-units owed, by you, to this station. You are hereby ordered not to leave this station until the debt is paid back in full. If your debts are not paid within seventy-two Earth-standard hours, your ship will be impounded. “Thank you for visiting Q-112.” The voice was actually earnest about the concluding sentiment. Bonner held back a groan. He knew from long experience the quality of employment offered by those with ready credits. If the job wasn’t illegal or immoral, it would be boring and simple. The choices would almost always be between bad and worse. And there he was, stuck making those choices again. “This is going to be fun,” he said morosely. An instant later an man and a woman appeared on the upper-deck console screen. They were dressed alike in drab work coveralls. The man had dark hair, the woman dirty brown. Both seemed to be in their late twenties. Jake heaved a mighty sigh. He wanted to shout out, “Are there no new pleas in this galaxy? Am I the only human who knows our history?” He had traveled far and wide through human space, so he had heard of oppressed worlds. His parents had given him an appreciation of the history of the human race, so he knew about rebellions, their causes, and their outcomes. So when Clarissa Rosen said what she did, Jake had no doubt what they were going to ask him to do. It was, however, more than a little frustrating to know where the Rosens were heading. It meant that their job offer carried with it a rather predictable set of actions he would have to take: organization; subversion; then direct action against the regime. If what Clarissa said was true, each of these would be easy tasks to accomplish. There would be no real challenge to the job, just another go-through of the motions that have been carried on since time immemorial. No, he reminded himself, there would be one challenge: getting paid. Rebels as a rule didn’t have much on hand to compensate hired help. Getting into power might allow them to reward his work, but the odds were that the Rosens were from some podunk colony with an annual income only slightly higher that his present debt load. The compensation was fairly unlikely to equal the amount of work he’d have to put out to help them succeed. It took a moment, but Jake snapped out of his shock. When he did he he realized that the couple had been surprised that he knew what they were going to ask before they asked it. If they didn’t know, he reasoned, they probably don’t know how to go about waging a revolution. It will mean lots of work, but their offer will more than compensate for that. I’ll be set for life, and I won’t have to take boring jobs like this one anymore. The man entered the bridge through the entranceway opposite the control area. Sidney Kraft might have been in his late thirties, but it was more likely that he was faking it. His hair was too neatly in place, his skin too tanned and smooth, and his shape too sculpted. His clothes reminded Jake of a pink Christmas tree. “You Jake Bunter?” Sid asked. His voice was way too smooth. “No,” Jake answered. He scrolled to the end of the digital contract and signed the screen on the “dotted line.” He started to hand the device back to Sid when Sid pointed to it. Jake shook his head. “I hate him already,” he said.